S Repertinger, B Teruya, D Sarma. Common Spindle Cell Malignant Neoplasms of the Skin: Differential Diagnosis and Review of the Literature. The Internet Journal of Dermatology. 2008 Volume 7 Number 2. Malignant and borderline-malignant neoplasms of the dermis can pose diagnostic challenges. Because these tumors can share similar clinical and histologic features, including a predominantly spindle cell morphology, the pathologist must be familiar with these entities in order to facilitate accurate diagnosis, as treatment for these tumors may be different. 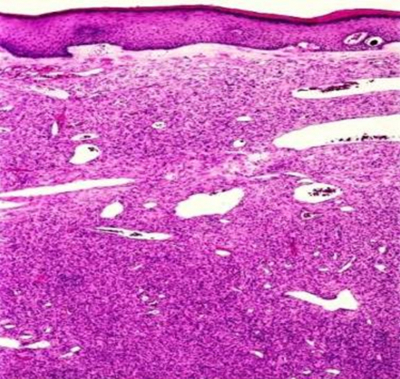 We review several of these lesions with respect to clinical and histologic features: desmoplastic melanoma, spindle cell carcinoma, spindle cell atypical fibroxanthoma, dermatofibrosarcoma protuberans, and cutaneous leiomyosarcoma. While malignant spindle cell neoplasms of the dermis are relatively rare tumors, they occur with enough frequency that the practicing pathologist must be adept at recognizing such tumors and making accurate diagnoses, as treatment of these various lesions may be disparate. That being said, however, differential diagnosis can be extremely difficult, with each lesion showing overlapping clinical and histologic features. Fortunately immunohistologic analysis greatly aids in the diagnostic process. We describe five malignant spindle cell neoplasms of the dermis encountered by the practicing pathologist and review clinical and diagnostic features of each, with the aim of providing a practical guide for the general surgical pathologist. Desmoplastic melanoma (DM) is a rare variant of spindle cell melanoma and an uncommon form of melanoma, comprising 4% of all melanomas. DM was first described by Conley et al. in 1971 as an inconspicuous superficial melanocytic lesion of the head and neck, preceding the development of a bulky dermal and subcutaneous tumor . The tumor presents in older individuals as a flesh-colored or variably pigmented nodule measuring on average 2 cm. It is usually seen on sun-exposed skin (37%) but also on mucosal and acral sites. Males are affected more often than women, with the exception of the lower limbs. If prominent neurotropism is present, which occurs in at least 30% of cases, nerve invasion can produce dysesthesias or nerve palsies. DM often is difficult to detect clinically, since half lack pigmentation. Pale lesions, in particular, are mistaken clinically for basal cell carcinoma, dermatofibroma, or scar. Pigmentation often is due to an associated lentigo maligna or superficial spreading melanoma. Unusual presentations include young age, an erythematous nodule, or alopecia. Ulceration is uncommon. DM is composed of usually non-pigmented fusiform melanocytes which often resemble fibroblasts (Figure 1). The atypical melanocytes are embedded within collagen bundles and may be associated with mild to marked stromal fibrosis. Phenotypical heterogeneity is under-recognized and desmoplasia may be seen throughout the tumor or in combination with conventional melanoma (“combined” DM) [3, 4]. Ultrastructurally, the desmoplastic component appears to derive from melanocytes that have undergone adaptive fibroplasia . Most often the spindle cells are arranged in a haphazard fashion, but are sometimes arranged in parallel bundles or in storiform configurations. The spindle cells are usually mildly to moderately atypical, although cells with larger, more hyperchromatic nuclei are often seen. Paucicellular variants of DM, in particular, are easily missed on small biopsy specimens. Junctional components are sometimes minimal or absent. Mitotic rate is variable but often is low, with abnormal forms in the more cellular tumors. 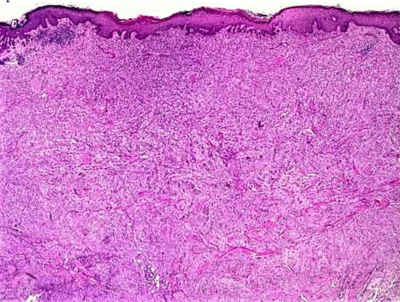 The overlying epidermis may be thinned or thickened with clusters of lymphocytes located at the tumor periphery. Neurotropism is a common feature (seen in up to 30%) and neural differentiation with a malignant peripheral nerve sheath-like histology may be seen [5-8]. Neurotropism may be peri- or intraneural and may extend beyond the desmoplastic component. An osteogenic variant has been reported . The spindle cells in DM are positive for S-100 protein (Figure 2), although sometimes within only a few nuclei (Table 1). Neuron-specific enolase (NSE) and smooth muscle actin (SMA) may be positive, while HMB45 (Figure 3) and Melan-A (MART-1) and are usually negative [10-13]. Microphthalmia transcription factor (MITF) may (Figure 4) or may not be positive No single specific marker is yet available to differentiate desmoplastic melanomas from other tumors . Figure 1. Dermal spindle cell neoplasm. Figure 4. Tumor cells show strongly positive nuclear stain with MITF. Desmoplastic melanoma was reported in the older literature as having a worse prognosis when compared to other types of melanoma. However, recent findings suggest that prospectively diagnosed and definitively treated lesions show the same survival rate as the usual forms of melanoma when various histologic parameters and risk factors are controlled. Expression of N-cadherin may portend a poorer prognosis, however . Treatment is with wide local excision. Spindle Cell (Squamous Cell) Carcinoma. Squamous cell carcinoma is the second most common cutaneous malignancy after basal cell carcinoma. The uncommon spindle cell variant occurs commonly on sun-exposed surfaces of elderly patients as a plaque or as an enlarging tan to red nodule, often with surface ulceration and crusting. The spindle cell (squamous cell) carcinoma (SCSCC) may be associated with previous skin injury, including trauma and radiotherapy. 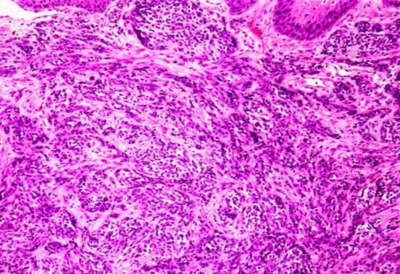 Four histopathologic categories of squamous cell carcinoma are described: conventional, spindle cell, acantholytic, and verrucous. In the uncommon spindle cell variant, atypical spindle cells emanate from the epidermis and form whorls intermingling with strands of collagen (Figures 1, 2). Within the dermis, the cells form intertwining fascicles and bundles. Individual tumor cells have indistinct borders and contain eosinophilic cytoplasm. Nuclei are hyperchromatic or vesicular and elongated. Nuclei may be pleomorphic and contain multiple nucleoli. Mitotic activity is brisk and atypical forms may be seen. With cellular pleomorphism and tumor giant cell formation, the tumors can bear a close resemblance to atypical fibroxanthoma. 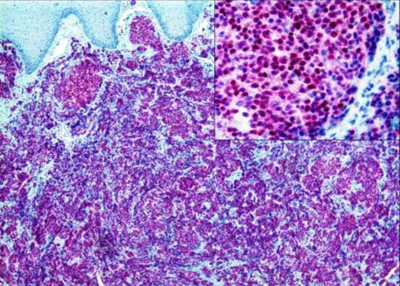 In fact, prior to the advent of immunohistochemistry, these lesions were often misdiagnosed. 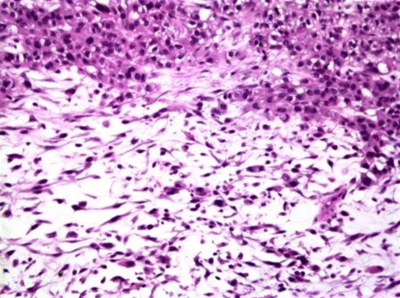 Connection of malignant tumor cells to the epidermis or foci of more typical squamous differentiation favor spindle cell carcinoma. Cytokeratin stains (Figure 7) are usually helpful. In addition, SCSCC can stain positively with mesenchymal markers such as vimentin (Figure 8) and smooth muscle actin. Recently it has been suggested that p63 may be a useful marker for SCSCC; Dotto et al. reports a series of 13 cases of SCSCC in which nuclear expression was seen in all cases, while focal labeling was seen in only 2/4 cutaneous leiomyosarcomas and 2/10 atypical fibroxanthomas . Figure 5. 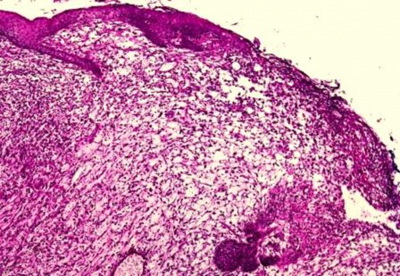 Ulcerating tumor infiltrates into the dermis and is composed of solid nests of squamoid cells as well as pleomorphic spindle cells. Figure 7. Both epithelial and spindle cells are positive for CK AE 1/3 (Cytokeratin). Figure 8. Both epithelial and spindle cells are positive for Vimentin. Spindle-cell squamous cell carcinoma is a poorly differentiated variant of squamous cell carcinoma with the potential for an aggressive clinical course. One-third of cutaneous squamous cell carcinomas that metastasize are of this type. Treatment is surgical. Metastases usually first occur to the regional lymph nodes. Atypical fibroxanthoma (AFX) usually arises in sun-exposed skin of the head and neck in older patients, often on the nose and cheek. Therapeutic radiation is a predisposing factor, with tumors usually appearing more than a decade following treatment. AFX usually presents as a nodule, which is sometimes ulcerated. The surface may be reddened and polypoid, resembling a capillary hemangioma. AFX is a highly cellular mesenchymal tumor. There is an extensive proliferation of spindled to polygonal cells (Figures 9 and 10), which in the usual form closely resemble malignant fibrous histiocytoma (MFH) of the deep soft tissues. AFX are expansile, dermal nodules that may reach the epidermis causing pressure atrophy. Often there is a connection to the overlying epidermis. In other cases, an uninvolved portion of overlying dermis, or grenz zone, is present. In addition, the tumor can compress skin appendages latererally. AFX does not extensively involve the subcutis and does not invade deeper structures. Areas adjacent to the lesion may show solar elastosis, vascular dilation, and capillary proliferation. Hemorrhage can be extensive, with the associated presence of hemosiderin-laden macrophages. Scattered inflammatory cells can be seen. In contrast with the usual type of AFX, the spindle cell variant is not pleomorphic, although most cases contain scattered giant cells of varying proportion [17, 18]. Sclerosis may be prominent and the lesion may be active mitotically. This morphology creates diagnostic difficulties because of its resemblance to other malignant spindle cell tumors. An absence of junctional nesting argues against malignant melanoma, although caution must be taken as some spindle cell desmoplastic melanomas lack a junctional component. 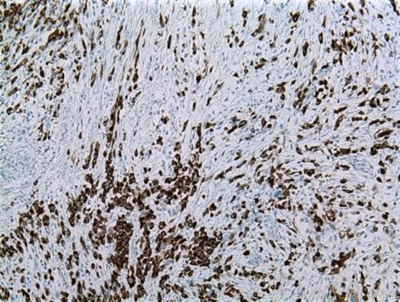 Differentiation from spindle cell melanoma is suggested by lack of an overlying in-situ melanoma component and absence of S-100 staining in tumor cells. The cells of AFX are HMB-45 negative (Table 1). Spindle cell carcinomas show positive staining for cytokeratin and often keratinocyte dysplasia or Bowen’s disease is present at the edge of the lesion. Leiomyosarcoma can be confused with this variant of AFX. AFX, however, is desmin negative and shows only focal actin positivity. The neoplastic cells of AFX are positive for vimentin and CD68 (Figure 11). Matthew et al. reported CK117 positivity in 15/16 AFX, suggesting that c-kit may be a sensitive marker . Figure 9. Diffusely infiltrating dermal tumor. Figure 10. The tumor is composed of predominantly pleomorphic polygonal cells. Figure 11. 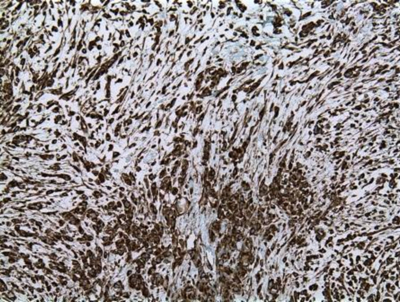 Tumor cells show positivity with CD68 immunostain. Although AFX may be indistinguishable from MFH histologically, the prognosis is excellent following conservative excision. Most authors agree that larger tumors (>2 cm) which extensively invade subcutaneous tissue such as fascia or muscle, or show necrosis or vascular invasion, should be diagnosed as MFH. Lack of H-ras and K-ras mutations in AFX but presence in MFH further suggest biologic differences between these two entities . Dermatofibrosarcoma protuberans (DFSP) is a neoplasm regarded as a superficial low-grade sarcoma. The lesion most commonly presents in young to middle-aged persons on the trunk or proximal extremities as an indurated plaque with one or more associated gray-white nodules. DFSP presents less often at other body sites, including the head, neck, and distal extremities [21, 22]. Early lesions are sharply-demarcated or plaque-like, often with peripheral red or blue discoloration. At this stage, lesions may clinically resemble morpheaform basal cell carcinoma. Advanced lesions are fungating and ulcerated. Sometimes the tumors contain gelatinous or translucent areas corresponding microscopically to myxoid change. Hemorrhage and cystic degeneration can occur. DFSP exhibits slow and persistent growth, often over several years. There is evidence that many tumors develop during childhood and become clinically apparent later in life. Congenital and childhood forms are known, but may not come to attention early because of difficulty in clinical detection [23-25]. DFSP shows a dense proliferation of monotonous spindle cells that diffusely infiltrate the dermis and subcutis (Figure 12). 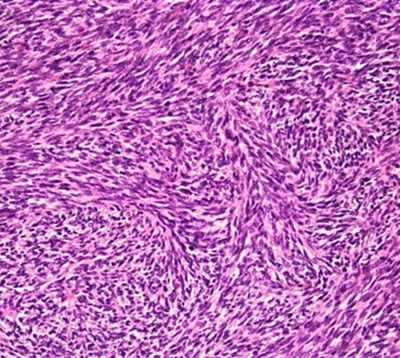 The center of the tumor is composed of slender fibroblasts which contain moderately-enlarged, tapered nuclei and are arranged around inconspicuous vessels in a distinctive storiform configuration (Figure 13). Occasional mitoses are seen but are not abundant. Atypical forms are usually not seen. The tumor may extend to the epidermis or, alternatively, a grenz zone is seen. Lateral extension of the tumor beyond the dermal component may be marked but subtle. DFSP has a characteristic pattern of subcutaneous infiltration, including growth along septa and between lipocytes in a honeycomb configuration or horizontally layered, parallel to the epidermal surface. Other findings in DSFP are seen rarely, including multinucleated giant cells, hypercellular zones, and myoid or myofibroblastic differentiation [26-28]. Occasional tumors contain myxoid areas, and when prominent, the storiform pattern becomes less apparent. Unusual variants include sclerosing [29, 30] and pigmented types. Histology with a discrete fascicular or “herringbone” pattern may suggest fibrosarcomatous transformation. The mitotic rate is usually, but not always, higher when this occurs, although occasional examples of DFSP demonstrate up to 35 mitotic figures per high power field . It is currently unclear whether fibrosarcomatous areas are more common in recurrent lesions. Recent studies have shown this not to be the case. 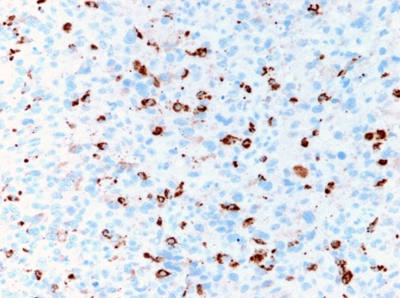 The tumor cells in DSFP stain immunohistochemically with CD34 (Figure 14), the human progenitor cell antigen, in a significant proportion of its cells, making CD34 a highly sensitive marker for this entitiy. Care should be taken not to interpret entrapped CD34 + dermal dendritic cells as tumor cells. Almost all cases of DFSP express the chromosomal translocation t (17:22) when investigated with the newest molecular techniques, including multiplex reverse transcription polymerase chain reaction (RT-PCR) and fluorescence in situ hybridization (FISH) . The translocation results in a fusion of the collagen type I α I (COL1A1) gene on chromosome 17 with the platelet-derived growth factor beta (PDGFß) on chromosome 22 and is most commonly located on a ring chromosome. The fusion transcript leads to constitutive activation of the PFGRß protein tyrosine kinase, resulting in uncontrolled tumor growth. DFSP has been found to differ from other soft tissue tumors with similar histology by the expression of this distinct set of genes. In addition, PDGFBR, the receptor for PDGFß, is highly expressed in DFSP, suggesting an autocrine stimulatory loop that may contribute to tumorigenesis . Figure 12. Diffuse monotonous spindle cell infiltration in dermis. Figure 14. The tumor cells are strongly positive for CD34. While generally indolent, the tumor possesses a tendency for progressive growth, recurrence, and rarely distant metastasis. With wide excision and careful pathologic examination of surgical margins, even local recurrence is extremely low . In one large study of 218 DFSP patients, there was no significant difference in crude cumulative incidence of local relapses between primary and recurrent disease and in cases with positive and negative margins . Fibrosarcomatous or malignant fibrous histiocytomatous transformation can occur, although the effect on the biologic behavior of such a transformation is controversial. Adequacy of wide excision may be more important to prognosis than the presence of the sarcomatous component per se [36-40]. Transformation to a fibrosarcomatous component has been associated with microsatellite instability  and p53 mutations [41, 42]. Primary leiomyosarcomas (LMS) of the skin are relatively rare sarcomas, reported infrequently in the literature. LMS of the skin are divided into dermal and subcutaneous types. The dermal type is discussed here and tends to develop in adults of middle to older age. It arises as one or several dermal or subcutaneous nodules, most often on the hip, thigh, or knee . Other locations, including the face and scrotum, are reported. Many tumors are present for years before coming to clinical attention  and often resemble epidermal cysts. Women may be slightly more affected than men. Lesions can be painful. Intra-dermal LMS is usually poorly circumscribed, in contrast with nodular lesions within the subcutis. 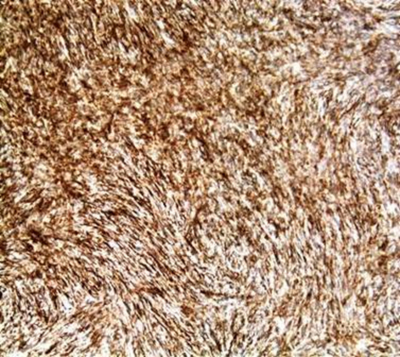 It is composed of interwoven fascicles of spindled cells which merge with a collagenous stroma. Subcutaneous involvement is sometimes present. Histopathologically, two growth patterns were described by Kaddu et al : nodular and diffuse. 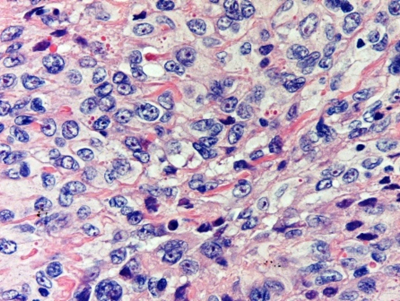 Intra-dermal LMS with a nodular growth pattern showed high cellularity, prominent nuclear atypia, numerous mitoses, and sometimes extensive necrosis. Intra-dermal LMS with a diffuse growth pattern, on the other hand, revealed low cellularity, well-differentiated smooth muscle cells, few mitotic figures, and few or no necrotic cells, making the diagnosis of a malignant neoplasm difficult. Unusual variants are described, including a desmoplastic type, which can be misdiagnosed as cutaneous sclerosis [39, 47-50]. 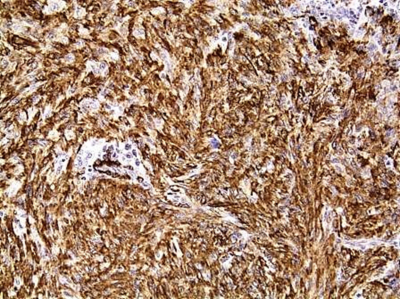 Immunohistochemical staining generally shows positivity for vimentin and smooth muscle actin (Figure 17), regardless of tumor site [44, 51]. Desmin, cathepsin B, and myelin basic protein positivity is variable. Dermal tumors are more likely than subcutaneous tumors to express S-100 protein . Interestingly, cytokeratin positivity is occasionally seen . In addition, positivity for p53 protein is seen in some cases, suggesting the involvement of this tumor suppressor gene in the pathogenesis . Figure 15. 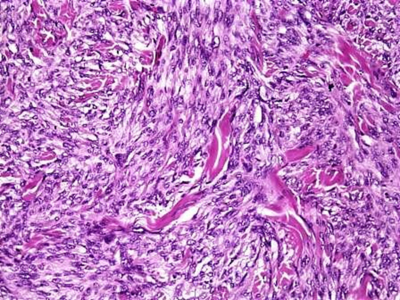 Spindle cell tumor of the dermis extends to the basal area of the overlying epidermis. Figure 16. Higher magnification of the dermal spindle cell tumor. In a series of 65 primary cutaneous LMS reported by Fields et al. and in smaller series reported by other authors [46, 48], LMS can recur, sometimes due to incomplete surgical excision . None metastasize, despite high mitotic activity and marked cytologic atypia  in some cases. Recurrent tumors may be more atypical and located deeply . Reported cases of metastases appear in the older literature . Spindle cell malignancies of the skin, some of which are not particularly common, are nevertheless seen by the practicing dermatologists and pathologists. Such tumors are not always easily differentiated on histologic findings alone and many, if not all, must be confirmed with immunohistochemical staining (Table 1). A thorough familiarity with these lesions is a necessity, as prognosis and treatment may be different. 1. Conley, J., R. Lattes, and W. Orr, Desmoplastic malignant melanoma (a rare variant of spindle cell melanoma). Cancer, 1971. 28(4): p. 914-36. 2. From, L., et al., Origin of the desmoplasia in desmoplastic malignant melanoma. Hum Pathol, 1983. 14(12): p. 1072-80. 3. Busam, K.J., et al., Cutaneous desmoplastic melanoma: reappraisal of morphologic heterogeneity and prognostic factors. Am J Surg Pathol, 2004. 28(11): p. 1518-25. 4. McCarthy, S.W., R.A. Scolyer, and A.A. Palmer, Desmoplastic melanoma: a diagnostic trap for the unwary. Pathology, 2004. 36(5): p. 445-51. 5. Cruz, J., J.S. Reis-Filho, and J.M. Lopes, Malignant peripheral nerve sheath tumour-like primary cutaneous malignant melanoma. J Clin Pathol, 2004. 57(2): p. 218-20. 6. Tsao, H., A.J. Sober, and R.L. Barnhill, Desmoplastic neurotropic melanoma. Semin Cutan Med Surg, 1997. 16(2): p. 131-6. 7. Kossard, S., E. Doherty, and E. Murray, Neurotropic Melanoma. 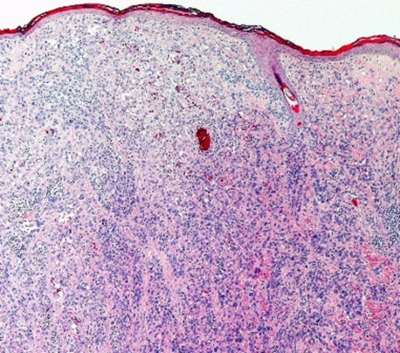 A variant of desmoplastic melanoma. Arch Dermatol, 1987. 123(7): p. 907-12. 8. Bruijn, J.A., et al., Desmoplastic melanoma: clinicopathologic aspects of six cases. Dermatology, 1992. 185(1): p. 3-8. 9. Emanuel, P.O., et al., Aggressive osteogenic desmoplastic melanoma: a case report. J Cutan Pathol, 2007. 34(5): p. 423-6. 10. Hoang, M.P., et al., CD34 expression in desmoplastic melanoma. J Cutan Pathol, 2001. 28(10): p. 508-12. 11. King, R., et al., Microphthalmia transcription factor expression in cutaneous benign, malignant melanocytic, and nonmelanocytic tumors. Am J Surg Pathol, 2001. 25(1): p. 51-7. 12. Granter, S.R., et al., Microphthalmia transcription factor: not a sensitive or specific marker for the diagnosis of desmoplastic melanoma and spindle cell (non-desmoplastic) melanoma. Am J Dermatopathol, 2001. 23(3): p. 185-9. 13. Anstey, A., et al., Desmoplastic malignant melanoma. An immunocytochemical study of 25 cases. Am J Dermatopathol, 1994. 16(1): p. 14-22. 14. Ohsie, S.J., et al., Immunohistochemical characteristics of melanoma. J Cutan Pathol, 2008. 35(5): p. 433-44. 15. Attis, M.G., et al., Differential expression of N-cadherin distinguishes a subset of metastasizing desmoplastic melanomas. Hum Pathol, 2006. 37(7): p. 899-905. 16. Dotto, J.E. and E.J. Glusac, p63 is a useful marker for cutaneous spindle cell squamous cell carcinoma. J Cutan Pathol, 2006. 33(6): p. 413-7. 17. Longacre, T.A., B.R. Smoller, and R.V. Rouse, Atypical fibroxanthoma. Multiple immunohistologic profiles. Am J Surg Pathol, 1993. 17(12): p. 1199-209. 18. Bruecks, A.K., S.A. Medlicott, and M.J. Trotter, Atypical fibroxanthoma with prominent sclerosis. J Cutan Pathol, 2003. 30(5): p. 336-9. 19. Mathew, R.A., et al., CD117 immunoreactivity in atypical fibroxanthoma. Am J Dermatopathol, 2008. 30(1): p. 34-6. 20. Sakamoto, A., et al., H-, K-, and N-ras gene mutation in atypical fibroxanthoma and malignant fibrous histiocytoma. Hum Pathol, 2001. 32(11): p. 1225-31. 21. Rabinowitz, L.G., et al., Acrally occurring dermatofibrosarcoma protuberans in children and adults. J Dermatol Surg Oncol, 1994. 20(10): p. 655-9. 22. Mizushima, J., et al., Dermatofibrosarcoma protuberans of the sole. Dermatology, 1996. 192(3): p. 280-2. 23. Maire, G., et al., A clinical, histologic, and molecular study of 9 cases of congenital dermatofibrosarcoma protuberans. Arch Dermatol, 2007. 143(2): p. 203-10. 24. Martin, L., et al., The atrophic variant of dermatofibrosarcoma protuberans in childhood: a report of six cases. Br J Dermatol, 1998. 139(4): p. 719-25. 25. Weinstein, J.M., et al., Congenital dermatofibrosarcoma protuberans: variability in presentation. Arch Dermatol, 2003. 139(2): p. 207-11. 26. Sigel, J.E., W.F. 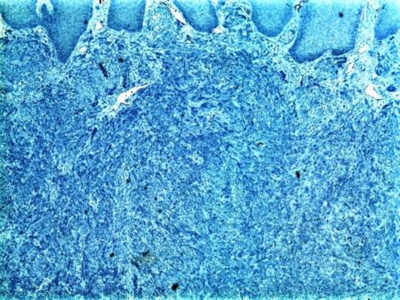 Bergfeld, and J.R. Goldblum, A morphologic study of dermatofibrosarcoma protuberans: expansion of a histologic profile. J Cutan Pathol, 2000. 27(4): p. 159-63. 27. Llatjos, R., et al., Palisading and verocay body-prominent dermatofibrosarcoma protuberans: a report of three cases. Histopathology, 2000. 37(5): p. 452-5. 28. Oliveira-Soares, R., et al., Dermatofibrosarcoma protuberans: a clinicopathological study of 20 cases. J Eur Acad Dermatol Venereol, 2002. 16(5): p. 441-6. 29. Sabater-Marco, V., et al., Sclerosing dermatofibrosarcoma protuberans (DFSP): an unusual variant with focus on the histopathologic differential diagnosis. Int J Dermatol, 2006. 45(1): p. 59-62. 30. Diaz-Cascajo, C., W. Weyers, and S. Borghi, Sclerosing dermatofibrosarcoma protuberans. J Cutan Pathol, 1998. 25(8): p. 440-4. 31. Connelly, J.H. and H.L. Evans, Dermatofibrosarcoma protuberans. A clinicopathologic review with emphasis on fibrosarcomatous areas. Am J Surg Pathol, 1992. 16(10): p. 921-5. 32. Patel, K.U., et al., Dermatofibrosarcoma protuberans COL1A1-PDGFB fusion is identified in virtually all dermatofibrosarcoma protuberans cases when investigated by newly developed multiplex reverse transcription polymerase chain reaction and fluorescence in situ hybridization assays. Hum Pathol, 2008. 39(2): p. 184-93. 33. Linn, S.C., et al., Gene expression patterns and gene copy number changes in dermatofibrosarcoma protuberans. Am J Pathol, 2003. 163(6): p. 2383-95. 34. DuBay, D., et al., Low recurrence rate after surgery for dermatofibrosarcoma protuberans: a multidisciplinary approach from a single institution. Cancer, 2004. 100(5): p. 1008-16. 35. Fiore, M., et al., Dermatofibrosarcoma protuberans treated at a single institution: a surgical disease with a high cure rate. J Clin Oncol, 2005. 23(30): p. 7669-75. 36. Szollosi, Z. and Z. Nemes, Transformed dermatofibrosarcoma protuberans: a clinicopathological study of eight cases. J Clin Pathol, 2005. 58(7): p. 751-6. 37. Abbott, J.J., A.M. Oliveira, and A.G. Nascimento, The prognostic significance of fibrosarcomatous transformation in dermatofibrosarcoma protuberans. Am J Surg Pathol, 2006. 30(4): p. 436-43. 38. Szollosi, Z., et al., Transformed dermatofibrosarcoma protuberans: real time polymerase chain reaction detection of COL1A1-PDGFB fusion transcripts in sarcomatous areas. J Clin Pathol, 2007. 60(2): p. 190-4. 39. Diaz-Cascajo, C., et al., Dermatofibrosarcoma protuberans with fibrosarcomatous areas: a clinico-pathologic and immunohistochemic study in four cases. Am J Dermatopathol, 1997. 19(6): p. 562-7. 40. Mentzel, T., et al., Fibrosarcomatous ("high-grade") dermatofibrosarcoma protuberans: clinicopathologic and immunohistochemical study of a series of 41 cases with emphasis on prognostic significance. Am J Surg Pathol, 1998. 22(5): p. 576-87. 41. Takahira, T., et al., Microsatellite instability and p53 mutation associated with tumor progression in dermatofibrosarcoma protuberans. Hum Pathol, 2004. 35(2): p. 240-5. 42. Sasaki, M., et al., Dermatofibrosarcoma protuberans: an analysis of proliferative activity, DNA flow cytometry and p53 overexpression with emphasis on its progression. Pathol Int, 1999. 49(9): p. 799-806. 43. 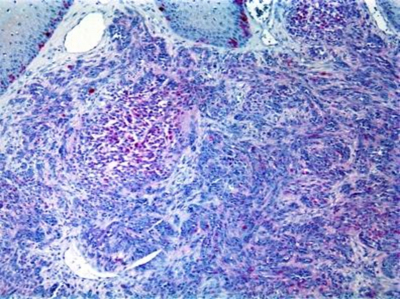 Jensen, M.L., et al., Intradermal and subcutaneous leiomyosarcoma: a clinicopathological and immunohistochemical study of 41 cases. J Cutan Pathol, 1996. 23(5): p. 458-63. 44. Limaiem, F., et al., Primary cutaneous leiomyosarcoma: a histological and immunohistochemical study of 4 cases. Pathologica, 2007. 99(6): p. 415-9. 45. Chow, J., et al., Cutaneous leiomyosarcoma: case reports and review of the literature. Ann Plast Surg, 1987. 18(4): p. 319-22. 46. Kaddu, S., et al., Cutaneous leiomyosarcoma. Am J Surg Pathol, 1997. 21(9): p. 979-87. 47. Karroum, J.E., E.G. Zappi, and C.J. Cockerell, Sclerotic primary cutaneous leiomyosarcoma. Am J Dermatopathol, 1995. 17(3): p. 292-6. 48. Valeriani, M., et al., Recurrent cutaneous leiomyosarcoma. J Exp Clin Cancer Res, 1998. 17(1): p. 83-5. 49. Berzal-Cantalejo, F., et al., Desmoplastic cutaneous leiomyosarcoma: case report and review of the literature. J Cutan Pathol, 2006. 33 Suppl 2: p. 29-31. 50. Choy, C., A. Cooper, and S. Kossard, Primary cutaneous diffuse leiomyosarcoma with desmoplasia. Australas J Dermatol, 2006. 47(4): p. 291-5. 51. Bellezza, G., et al., Primary cutaneous leiomyosarcoma: a clinicopathological and immunohistochemical study of 7 cases. Int J Surg Pathol, 2004. 12(1): p. 39-44. 52. Swanson, P.E., et al., Primary cutaneous leiomyosarcoma. A histological and immunohistochemical study of 9 cases, with ultrastructural correlation. J Cutan Pathol, 1988. 15(3): p. 129-41. 53. Fields, J.P. and E.B. Helwig, Leiomyosarcoma of the skin and subcutaneous tissue. Cancer, 1981. 47(1): p. 156-69. 54. Dahl, I. and L. Angervall, Cutaneous and subcutaneous leiomyosarcoma. A clinicopathologic study of 47 patients. Pathol Eur, 1974. 9(4): p. 307-15.